The Dynamic Type feature allows users to choose the size of textual content displayed on the screen. It helps users who need larger text for better readability. It also accomodates those who can read smaller text, allowing more information to appear on the screen. Apps that support Dynamic Type also provide a more consistent reading experience. To add support for Dynamic Type in your app, you use text styles. A text style describes the use of the text, such as headline or body or title1, and lets the system know how best to adjust its size. You can configure text styles in either Interface Builder or your source code. Although custom fonts are supported in Dynamic Type, the preferred font is designed to look good at any size (for more information, see Typography). Also, using the preferred font ensures consistency within the system and with other apps. In Interface Builder, select the text style from the Font menu, then select the Automatically Adjust Font checkbox to the right of Dynamic Type. In your source code, call the preferredFont(forTextStyle:) method. 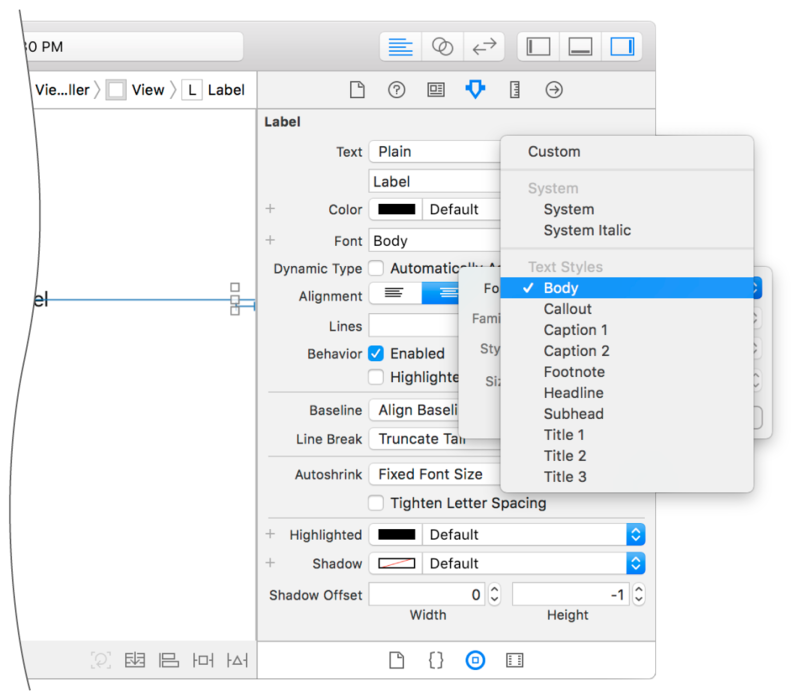 This method returns a UIFont that you can assign to a label, text field, or text view. Next, set the adjustsFontForContentSizeCategory property on the text control to true. This setting tells the text control to adjust the text size based on the Dynamic Type setting provided by the user. If the adjustsFontForContentSizeCategory property is set to false, the font will initially be the right size, but it won't respond to text-size changes the user makes in Settings or Control Center. To detect such changes, override the traitCollectionDidChange(_:) method in your view or view controller, and check for changes to the content size category trait. You can also observe didChangeNotification and update the font when the notification arrives. If you use a custom font in your app and want to let the user control the text size, you must create a scaled instance of the font in your source code. Call scaledFont(for:), passing in a reference to the custom font that's at a point size suitable for use with large. This is the default value for the Dynamic Type setting. You can use this call on the default font metrics, or you can specify a text style, such as headline. In Interface Builder, the Dynamic Type option to automatically adjust fonts applies only to text styles or scaled fonts returned by UIFontMetrics. It has no effect on custom fonts set in Interface Builder. Fonts created through UIFontMetrics behave the same as the preferred fonts the system provides. The system scales to match the user’s selected text size in a manner that's similar to the way the text style you supply is scaled.